I added UTV Media to the model portfolio back in December 2011. This investment has turned out to be very successful, although most of that is due to luck, which I’ll explain shortly. The short version of this case study is that the model portfolio owned UTV Media for about 7 months, it returned about 40% in capital gains, and there’s a dividend of four or five percent coming shortly. This fantastic result is mostly down to luck as most of the gains are from a steep share price increase, which is an unforeseeable, but very welcome event. However, picking the right company at the right price does help to an enormous extent. As usual I started with the UKVI stock screen in order to reduce the vast number of potential companies (over 1,000 on the UK markets) down to something manageable. Back in December, UTV media ranked highly. The growth rate was around 5%, PE10 (price to 10 year average earnings ratio) was very low at 5.3 and the dividend yield was 4.6%. The main reason that UTV appeared attractive was the exceptionally low PE10 rating. At the time the market average was nearer 12 to 14, so 5 really was very low. If those historic earnings turned out to be sustainable going forwards, then UTV shares were likely to head upwards at some point in the future. Once I’ve homed in on a company using the quantitative stage, I like to run through a checklist so that I can get a better feel for what the company is all about. This helps me to sleep better after I’ve bought the shares, and it also stops me buying shares in companies that look good by the numbers, but in reality turn out to be cheap rubbish rather than quality bargains. UTV Media is primarily a TV and Radio broadcast group. It was set up in 1959 to be the ITV license holder for Ireland and has held that license ever since. As well as TV they’re also the radio market leader in Ireland with a steak in over 20 radio stations throughout Ireland and the UK including TalkSPORT, the leading commercial talk station. In 2005 they took on around £100m of debt to finance the purchase of the Wireless Group and radio is now the largest contributor to revenue and profits, replacing its traditional focus on TV. Loading up with debt just before the recession turned out to be a bad idea and the company decided to do a rights issue for almost £50m in 2008 to avoid any debt related problems. That would have been painful for investors but at least it shows some level of prudence from management and a desire to avoid serious threats. Revenues and earnings per share had been broadly maintained through the recession. When I first reviewed the shares I thought that a return to a normal dividend policy may be the main driver of returns in the medium term. The first thing I do is make sure that adding a new company to the portfolio won’t over-expose it to any particular industry, geography or other risk factor. In this case the portfolio didn’t hold any media companies, so this wasn’t an issue. However, something to watch out for was the lack of geographic diversity within the company as UTV is based only in Ireland and the UK. I wasn’t overly concerned about that as long as the rest of the portfolio contained a fair number of international companies (which it does). In terms of size, UTV was as small as I would allow into the portfolio back in 2011, and now it would be too small as I’ll only consider FTSE 350 companies. At just over £100m it’s not a micro-cap, but it is a small-cap which can bring additional risks. For example, the shares are relatively illiquid with a bid/ask spread of 3%. You can see the company’s financial performance below. The most obvious sign of the recession is the dividend cuts from 2009. These were introduced in order to funnel cash towards the debt which had been taken on to fund the Wireless Group purchase. Net debt peaked at £117m in 2006 and has since been brought down to £63m in the latest interim report. The debt to operating profit ratio is now around 3.3, which is well within my limit of 5 and is a relatively normal level for many companies. Taking on large amounts of debt to follow the acquisition trail seems to be endlessly attractive to CEOs, but often it can end in tears – as it did for UTV Media. These weren’t catastrophic tears, but a 2 for 3 share split and earnings per share which are no better than they were before the take-over is not exactly a great result. However, debt at the time of purchase stood at £63m and that was almost down to the management’s target of 2x EBITDA (earnings before interest, tax, depreciation and amortisation). After that target is reached I hoped to see steady increases in the dividend over the next few years, back towards a pay-out ratio of 2. This would give a dividend in the 7-10p range for a 7-10% yield at then-current prices. At the time of purchase the forward yield was 4.6%, which is about 1% above that of the FTSE 100 at the time. The company has an unbroken history of dividend payments going back many years, although it did cut the dividend to divert the cash to debt payments in the recession. Normally I would prefer a company to have never cut the dividend, but not all companies have a progressive dividend policy. At least the dividend wasn’t cut to zero and the current low dividend has probably been the major driver of the current attractive price. In general I expected the dividend to recover to a much higher level than it was at the time. 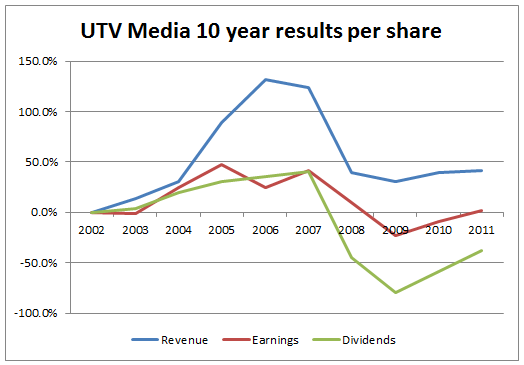 UTV was trading at only 5 times the average earnings of the past decade and at about 6 times adjusted earnings. By any stretch of the imagination that’s low for a company which is very likely to be a going concern. UTV is most certainly not a growth company. In all likelihood the next decade will look pretty much like the last which means that growth will be somewhere close to zero. That’s okay though as the investment premise was based on a reinstatement of a ‘normal’ dividend distribution, as well as continued earnings around historic levels rather than spectacular future growth. UTV Media was the market leader in commercial TV and radio in Ireland, as well as having numerous radio stations in the UK. It had been a steady platform for earnings for many years, reliably paying a divided each year and generally running the company in a sustainable manner. The debt levels had more or less returned to sensible levels and so the period where debt reduction was the key issue was probably coming to an end. That meant that a more normal dividend policy may return which would likely drive the share price up from where it was at the time. If not, then the yield should be very high which would be ample compensation until Mr Market did decide to increase the share price. Of course, once you’ve bought an investment, owned it for a while, received a dividend (perhaps), the next step is to decide when to sell, if at all. In this case I needed some cash to extend the portfolio from 20 to 30 companies. However, more importantly is the reason why is sold this particular stock. Imagine you bought a golden goose that laid golden eggs. Each egg was worth a hundred pounds. You bought the goose for a thousand pounds and you know that you can look forward to one egg a year. In this case you’re getting a ten percent return on your money every year. The thing is, your goose has a red beak, and a couple of years after you bought the goose, red beaks are all the rage. If you’re cool you have a golden goose with a red beak. So one day a nice chap comes to your house and offers to buy your golden goose for two thousand pounds. Now, being a bit curmudgeonly and not the least bit interested in fashion, you don’t care about the red beak. You also know that you can get another golden goose, this time with a blue beak, for the same one thousand pounds that you bought your original goose, and it will still lay the same egg, worth one hundred pounds, once a year. Of course, you also know that with two thousand pounds from the sale of your red beaked goose you can buy two blue beaked geese and get two golden eggs instead of one. That, in a nutshell (or eggshell), is sensible investing. You aren’t speculating about what the geese will be worth in a year or two, because frankly nobody knows. What you’re doing is buying as much return for your money as you can get. If somebody offers you a sum of money for an asset (like a golden goose), and you know you can get a better return with cash than you can from the asset (in this case you can turn the cash into two blue beaked geese and get two eggs instead of one), then you sell the asset. What does this all have to do with UTV Media? Well, quite a lot actually. In December I picked up the shares for 104.75p. At that price the yield was 4.6%, the PE10 was 5.3 and growth (which is independent of price) was 5.4%. On the 5th of July I sold the shares for 148p. At that price the yield was 4.4%, PE10 was 7.2, and growth was much the same. The underlying company hadn’t really changed. Okay, the chairman had been pushed out, but how that might affect things is pure speculation (and perhaps such speculation was a big part of why the share price had gone up so much). In essence, the higher price had weakened the dividend yield and raised the PE10 ratio (or lowered the E10 yield if you want to look at it that way). In other words, the amount of value in earnings and dividends that the shares offered for every penny invested was lower than it had been before, and was also lower than any other holding in my portfolio. This meant that UTV Media’s shares were the worst value shares that I owned, which is why I sold them, so that I can replace them with something else that is better value; something that gives me more yields more dividends, more earnings and more growth. Whether the shares now go on to 200p, or 300p is pure speculation. I do not know and neither does anybody else. But at 150p they offer far less value than they did at 100p, less than my other holdings, and less than other stocks in the market which I can replace them with. I love the goose analogy. Your reasons for parting with UTV seem sound enough to me apart from the weakening of the dividend yield. 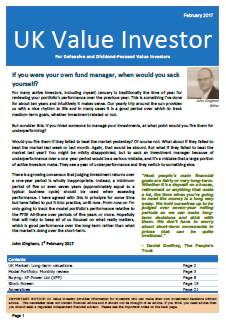 Do you not calculate your dividend yield from the price at which your purchased your shares as a measure of value rather than the current market price? 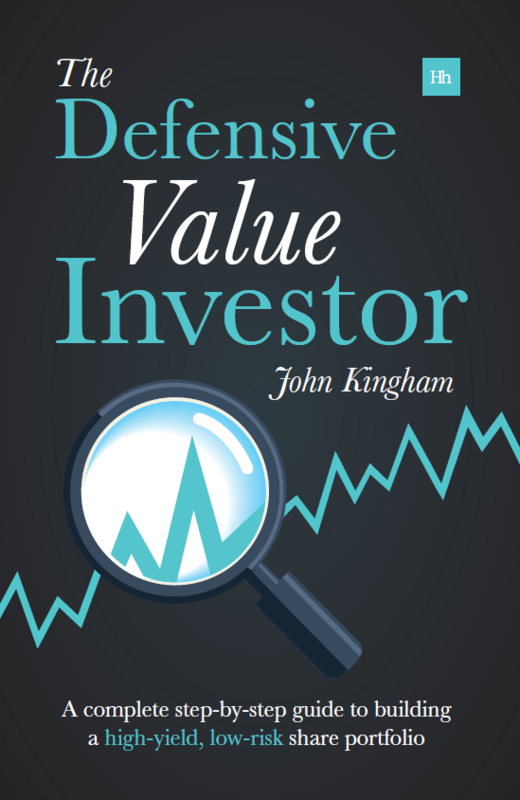 For example if you buy a company at 100p and dividends increase overtime that investment’s dividend yield increases because it is pegged to your purchase price. Hi David, yes that’s one way of looking at the dividend yield, i.e. relative to the purchase price. I know that some people make a lot of the fact that Buffett’s investment in Coke now yields something like 50% of the original price PER YEAR. However, I prefer to look at the current yield because the current price represents the cash amount that I could get if I sold today, and therefore the current yield tells me what I’m getting from my investment relative to that cash amount. If there are other shares out there that offer a much higher yield (assuming all other factors are equal or better than those of UTV), then in my opinion my capital is best allocated with those other higher yielding shares. Glad you like the site, and I’m a bit jealous of your site’s explosive header… makes mine look a bit dull!